After a relatively quiet 2017, markets have once again become jumpier this year. Since the end of January, the US S&P 500 Index is +2.1% as we write. However, the UK FTSE 100 Index is -3.9% and the MSCI Emerging Market Index is down a whopping -21.5% (see Table 1). Is this an opportunity or the proverbial falling knife? Is the UK investable today given the Brexit risk that overhangs it? We give our answer to both these questions in this quarter’s commentary and end with a brief outlook for 2019. The Opportunity in Emerging Markets? There is more than one culprit for the troubles that emerging market (EM) equities are having in 2018. Historically, the combination of a stronger US dollar and rising US interest rates (both of which we have seen this year) has put a squeeze on emerging market borrowers. We have of course seen this already in Turkey, which had a classic emerging market meltdown in August with foreign capital fleeing, a currency collapse and rates being raised sharply to try and lure the money back. However, these days’ countries like Turkey are more the exception than the rule. Turkey is in fact less than 1% of the MSCI Emerging Markets Index. Another perennial trouble-maker, Argentina, has now been kicked out of the MSCI emerging market indices all together. Instead, absent these smaller headline-grabbers, emerging markets have been remarkably stable in the face of a rising dollar. The main reason for this is that many of the larger emerging market countries – including China and Russia – run current account surpluses these days. This means (like Germany) rather than needing to borrow from the rest of the world to grow, they are in effect lending money to the rest of the world today so that we can buy their goods. There is of course always some residual reliance on external US dollar funding, but this has been relatively stable over the last few years (see Chart 1). Net/net then, for these countries rising US interest rates should be manageable and a stronger US dollar should, if anything, be a help for their surplus producing export sector. Instead, therefore, we think the source of emerging markets troubles lies closer to home. Although Chinese GDP has been remarkably (suspiciously) stable overall there has been a crackdown on the growth of the so-called shadow banking sector. This credit tightening has slowed China and the knock on impact has been material for many of the emerging market countries that export to it. Slower growth in emerging markets has contrasted with a booming US. Money, and returns, have flowed from EM to the United States. The question is, is this mini-China slowdown about to reverse? There are signs it might be: copper prices (a barometer for Chinese investment demand) are picking up again having fallen for the first half of the year and monetary conditions look to have ended their tightening phase. This would argue for adding to our EM exposure after this year’s 20% fall. However, there are two notes of caution. First, Trump and trade wars. Though the direct economic impact of additional US and Chinese tariffs is estimated to be relatively small (less than -0.2% of global GDP even if all the Trump threats come to pass), the indirect effect and its impact on investment decisions is much harder to quantify. Also, the trade war rhetoric looks to play well in opinion polls and fits in well with Trump’s particular brand of nationalism. Whatever happens in the November mid-term elections, we expect this story to remain in the news for as long as Trump is around (so 2020 at least). It is hard to be too optimistic about any permanent resolution here in the short term. Secondly, if you look under the hood of the Chinese equity market sell-off you can see it has been led by the fall of the internet darlings. Just as America has Facebook, Apple, Amazon, Netflix and Google (the so-called FAANGs) so China has Tencent, Alibaba and Baidu. Up until this year these tech giants grew in lockstep. However, in 2018 Baidu and Alibaba are down –28% from their respective peaks and Tencent is down –38%. This contrasts with the FAANGs which have continued their steady march higher and are today up +18% for the year in aggregate. It is this divergence between the US and Chinese technology companies that has been the number one driver of US equity outperformance year-to-date. Here, we prefer to keep our EM exposure rather than chase the US ever higher. Our reasoning is that these technology giants are increasingly looking today like natural monopolies and/or utilities. Everyone uses Google as a search engine, and because everyone uses it Google has the most data on what people want to search for and so can use this data to create an ever-improving search engine. The barriers to entry for new entrants are huge (not even Apple really bothers to compete in search). Natural monopolies are, eventually, subject to government regulation. Facebook has been the first in the US to feel the heat of extra regulatory scrutiny after its Cambridge Analytica data leak. However, in China, this story looks to be further developed. The Chinese have recently flexed their power with Tencent by limiting its ability to expand its gaming empire. Alibaba’s Jack Ma has stepped down from running the company. Today’s equity valuations increasingly reflect the fact that these companies will have to run in tandem with the government’s strategic aims rather than be pure profit centres and this has hit their valuations this year. We think a similar story will slowly come to pass in the US. We would therefore rather own EM equities today where more of this risk is priced in rather than US equities where the downside risk of increased regulatory reach looks much higher. Putting this together, the shorter term opportunity looks murky. Yes prices have fallen but we have not seen enough of an acceleration in China yet for this to be driving EM markets higher. Trump and his associated hostility to China also looks to be a story for markets for the next couple of years at least rather than going away any time soon. That said, timing tops and bottoms in markets is notoriously hard. Better to spot a longer term opportunity and commit to it than to miss it all together because you are too focussed on the right entry point. Here the longer term story for emerging markets looks much better. First valuations are well below those of developed markets and, unlike many developed markets, sit in the middle of their longer term range (see Chart 2). The advantage of lower prices is that you are paying less for the rights to your EM corporate profit stream. These profits can of course either be returned to you as a dividend or reinvested in the business. 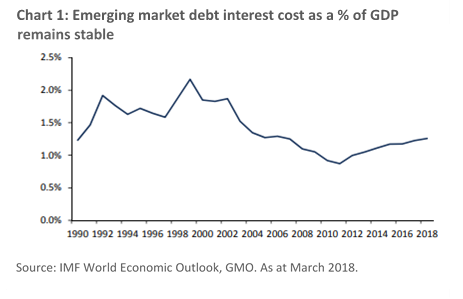 GMO, the asset management firm, have calculated this historic return for EM equities since 1996 and split it out between the dividend and return on capital invested (see Emerging Markets—No Reward Without Risk which we can supply a copy of on request). They have two alternative calculation methodologies but both show a historic 20 or so year real return (i.e. after inflation) of around 7%. 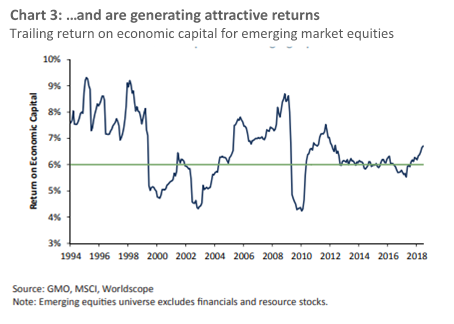 Happily, this is close to current real return on economic capital for EM equities (see Chart 3). Either way, a real return of around 7% from here looks very plausible. This means EM equities trade on reasonable valuations compared to long term averages, are in the middle of their recent valuation range today and have historically generated a 7% or so real economic return for their investors. 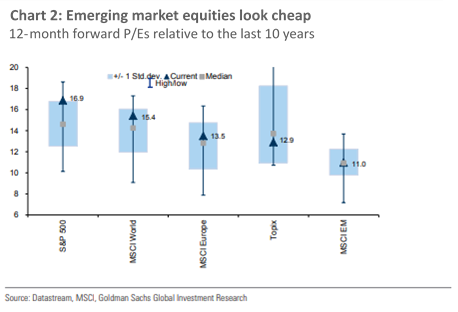 Whilst EM equities will remain volatile (hence the higher return!) there is no reason to expect this relationship not to hold into the future. The good news we have for you then is that EM equities should generate the longer term returns you as an investor are looking for. We are therefore looking to selectively add more EM exposure into our portfolios in Q4 where our risk budgets allow. It may not have escaped your attention that the UK is planning to exit the European Union on 29th March next year. Whilst this has (understandably) dominated the political discourse to the exclusion of almost anything else this year, the markets look much more sanguine about Brexit. Sterling – the barometer of Brexit worries – has not really moved at all on this year’s Brexit developments (good or bad), in sharp contrast to the period around the 2016 referendum. Currency and equity markets think a fudge/compromise that no one likes but everyone will sign up to as there is no alternative, is more or less a done deal. This of course raises the risk, that the Brexit journey is not as smooth as markets think today. Imagine (as now looks likely) Theresa May comes back with a watered down version of the Chequers plan in November (or December) but it is voted down by MPs. Then what? Resignation? New elections? A new referendum? A cliff edge hard Brexit? It is in many ways the uncertainty of opening this Pandora’s Box that means the deal will in fact most likely be voted through. But you just cannot rule out the risk that the UK’s politicians – who almost to an MP, dislike the Chequers plan – commit some sort of political Hari Kari. Labour MPs might like the idea of fresh elections, Brexiteers might welcome a hard Brexit. What then? Here we would offer some solace. 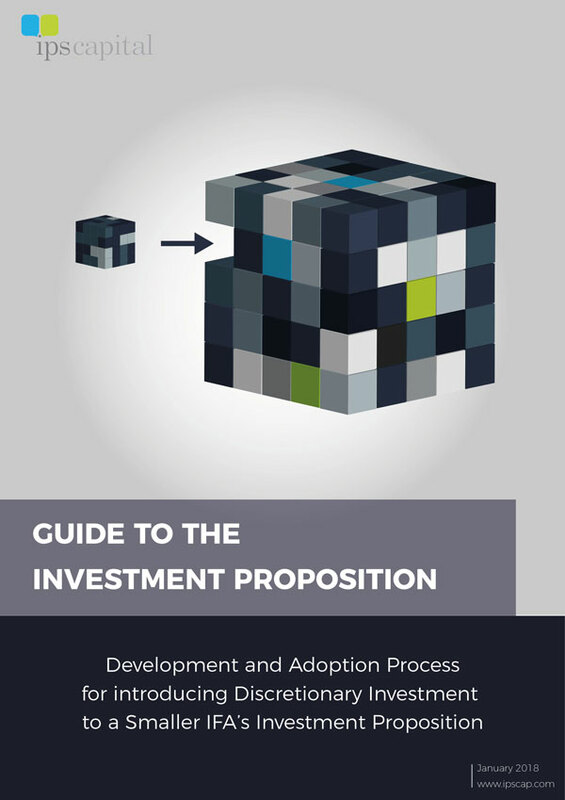 The majority of your investments remain overseas. We think – as happened with the referendum result itself – currency markets would see a hard Brexit as bad for the UK economy and so would fall sharply to a level low enough to attract new investment in again. If, again as happened in 2016, sterling fell faster than international asset markets, your portfolios might even in fact gain from the associated chaos. More broadly, however, the UK is around 3.5% of global GDP and 8% of global equity markets. We remain an interesting side-story to markets rather than the main event itself. Developments in the US and China should continue to be the main driver of global risk appetites. Our core belief remains that there is enough momentum in the global economy that recession risks remain low. We have written before about the current Goldilocks economy, which will either have to end with the economy turning too cold (recession) or too hot (inflation). With recession risks low today, inflation looks to be marginally the likelier outcome. For this reason our portfolios continue to have a focus on real assets (like equities and property). We have also added in some alternative investments (such as solar and wind farms) where the income return has an explicit inflation linkage. Finally, our absolute return funds tend to generate cash plus returns. As and when cash rates start to rise (as they have done already for our US dollar clients) we would expect the returns on these investments to rise as well. Finally, more inflationary markets should be associated with robust economic growth. Our equity book remains focussed on areas that should benefit from this including Japan and, as we mention above, emerging markets. 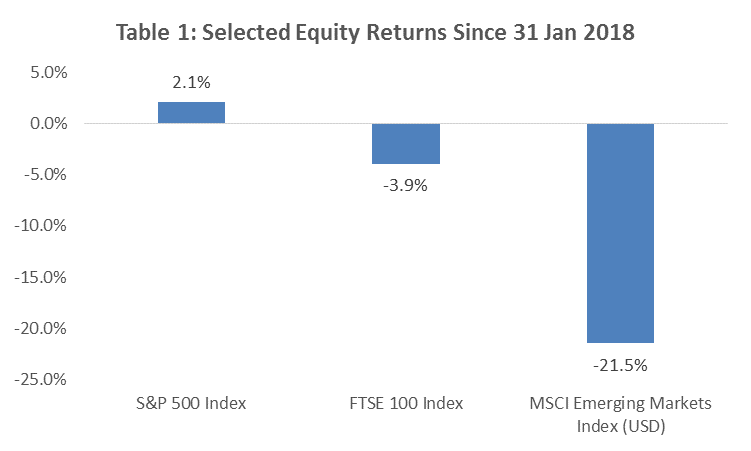 Though we are sure the ups and downs of market cycles will continue into 2019, we think we remain well positioned for longer term returns.